Property Description: Approximately a 1.5 acre developed lot located in the City of Green Park, zoned PL-I (Planned Light Industrial). Build you own building!!! 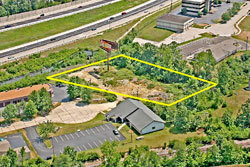 Last available lot in this industrial park. Visibility from I-55. Directions: Hwy.21 (Tesson Ferry Rd.) to Green Park Rd. Travel east on Green Park Rd. to Lin-Valle, turn right on Lin-Valle and proceed to end of street, which dead ends into this lot.